Video encoders helping you migrate your analog security system to an IP-based video solution. A video encoder (also referred to as video server) digitizes analog video signals and distributes digital images directly over an IP-based network (e.g. LAN/intranet/Internet), turning analog cameras into network cameras and enabling users to remotely monitor the cameras, as well as record and store video on standard PC servers. A video encoder brings new functionality to analog equipment and eliminates the need for dedicated equipment such as coaxial cabling, analog monitors and digital video recorders. A video encoder can be connected to a wide variety of specialized cameras, such as a highly sensitive black and white camera, a miniature or a microscope camera, in addition to fixed, dome, indoor, outdoor and pan/tilt/zoom analog cameras. A video encoder typically provides between one and four connections to analog cameras, as well as an Ethernet port to connect to the network. Like network cameras, it contains a built-in web server, a compression chip, an operating system and processing power for local intelligence. 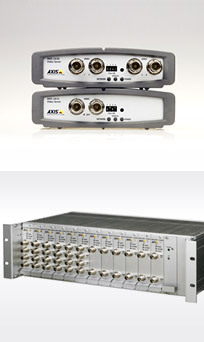 Besides digitizing analog signals, a video encoder can support a host of other functions: for example, digital inputs and outputs (I/O, which can trigger the encoder to start sending images or to activate alarms and devices such as lights and doors), audio, and serial port(s) for serial data or control of pan/tilt/zoom cameras and devices. With image buffering, a video encoder can also send pre- and post-alarm images. In a system involving many analog cameras, a video encoder rack together with blades (video encoders without their casings) can be used. Placing blade video encoders in racks allows them to be managed centrally with a common power supply and in some cases, a common Ethernet cable. One standard 19-inch rack can digitize up to 48 analog cameras. With analog cameras where coaxial cables have not been pulled to a central location, it is best to use stand-alone video encoders positioned close to each camera. This method reduces installation costs since it can take advantage of existing network cabling to transmit video, instead of running coaxial cables to a central location. It also eliminates the loss in image quality that would occur if video were to be transferred over long distances through coaxial cabling. A video encoder produces digital images, so there is no reduction in image quality due to the distance traveled. Video encoders helping you migrate your analog security system to an IP-based video solution. Video encoders digitize analog video signals and turning analog cameras into network cameras, enabling users to remotely monitor the cameras, as well as record and store video on standard PC servers. A video encoder brings new functionality to analog equipment and eliminates the need for dedicated equipment such as coaxial cabling, analog monitors and digital video recorders. Can the video encoder provide high-quality, deinterlaced digital video? The deinterlace filter eliminates the artifacts (a series of horizontal lines) caused by analog interlaced scanning technology. What are the resolutions needed? Do you require the ability to view and/or record at full frame rate? Do you require compression with Motion JPEG and/or MPEG-4? Can it integrate with different types of analog cameras, for example, pan/tilt/zoom cameras? How many analog channels can the rack handle? How many channels with full frame rate and full resolution can the system provide? Do you require I/Os, video motion detection, image upload, scheduled and triggered event functionality with alarm notification? How reliable is the video encoder/rack solution? When connecting to multiple analog CCTV cameras, it is crucial that the video encoder/rack solution can be relied upon. What are the available security features? Security features may include multiple user access levels; HTTPS encryption, which provides a secure channel between the video encoder and application; IEEE 802.1X, which allows a network to be secured with port-based authentication; and IP address filtering. Does the video encoder support Quality of Service? QoS helps secure the necessary bandwidth for streaming video and control commands over a network. Is the video encoder supported by a range of application software? Some video encoders may offer support for IPv6 (Internet Protocol version 6) addresses in addition to IPv4 addresses as insurance against the growing shortage of IPv4 addresses. How to migrate an analog CCTV system into a digital, networked solution? You have already made significant investments in analog CCTV Systems and as long as these systems are delivering value, you do not, understandably, see the need to change? So instead of starting from scratch, it is possible to combine your analog CCTV system with a network video system, thereby acquiring all the functionality and benefits that digital technology offers. The analog cameras are connected to an analog video switcher, which is then connected to an analog monitor, a VCR and a video encoder. The video encoder converts the analog video into digital signals which can then be sent over an IP network so that an authorized PC user at a remote location can view video originating from analog cameras. In the transition from analog to digital surveillance systems, no system is too small or too tightly tied to analog technology to benefit from digital technology.